Mantis was designed By Matt Cooper from Swansea Maine. I read about the boat in, an issue of Wooden Boat Builder magazine. When I contacted Matt Cooper about buying a set of plans for the boat, he informed me that the boat was a "concept boat" and that there were no plans at this time. After talking with him a time or to, he agreed to draw the actual building plans at no charge if I would document all my hours and expenses. And that is what we did. He would send me a couple of pages to get me started and then would send more drawings as the build progressed. It was a lot of fun talking to him and I was actively involved as the design developed. There were a few other people who were also interested, but I think I was the only one who actually built the boat. The original boat was built of plywood and covered with fiberglass. It had flat panels and hard chines and carried an outboard motor on the transom. The boat did not fold up and had to be taken apart for trailering. 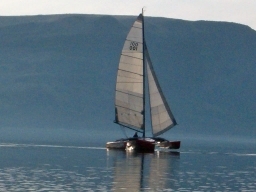 The plans called for a Hobie 16 mast and mainsail and jib. I sailed that boat for about four years and had a blast racing it all over the Pacific Northwest. After four years of sailing, the plywood I used in the construction started to literally fall apart. I spent about a year trying to patch things up. I really loved the boat and decided to build her again, but not in wood. The new boat is about four years old now and has so many changes and modifications that it bears little comparison to the wood boat. The new boat is made out of 3/8" Airex foam, epoxy and layers of 17oz. biaxial fiberglass cloth that is vacuum-bagged on male molds. This makes for a very strong but lightweight boat. The boat now has beautiful curved sections and is stronger than the plywood boat. The boat is three feet longer and the floats have a lot more flotation in them. I also jumped up to a Hobie 18 mast and then added seven feet to that. Along the way I added an extendable bowsprit and asymmetrical spinnaker. There are seats in the cockpit and also on the upper wings that extend out over the water. I had to teach myself how to make the molds and then learn how to vacuum-bag the parts. I lost track of the hours, but it took one winter to get the floats and cross bars built and then another winter to get the main hull finished. I spent a whole season sanding, fairing and painting and then building the rudder, dagger board, hatches and wiring the electrical system. She sits on a custom trailer that I made for winter storage and also for road trips to out of town races. During the sailing season the boat is moored at our local marina which is ten minutes away from my house. I go sailing almost every day and also throw in some night sailing as well. I live in Clarkton Washington and sail on the Snake River almost year round. Overall Length 24 feet... Sailing width 16 feet... Trailering width 9 feet... Total sailing weight 1800 pounds... Rotating mast length 35 feet... Main and jib total 350 sq. feet... Asymmetrical Spinnaker 350 Sq. feet... Auxiliary power 35hp Saildrive... 12 inch folding propeller... Electrics include running lights, masthead light, anchor light, CB Radio, VHF Radio, Red L.E.D. lights in the cockpit, bilge pumps in the three main hull watertight compartments, depth finder and digital knot meter. NOTE: In the lower left photo you will see Randy and Mantis being closely followed by Gary Hyde and M17 Hydeaway II as they round the mark in the 2006 Snake River Tribune Cup Race. Photo credits to Ellis Feeney for this great shot.